Kicker KM10 10 300W Marine Subwoofer LED Lighted 41KMW104LC. Waterproof Marine/Boat Subwoofer 10 300 Watts Kicker KM10 Sub with LED Backlighting (41KMW104LC). 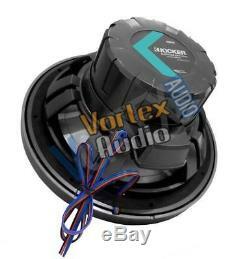 Kicker KM10 10 300 Watts Marine Subwoofer Waterproof Sub LED Lighted 41KMW104LC. 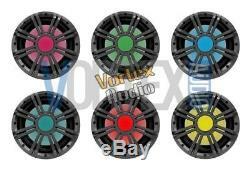 Categories: Marine Audio / Marine Subwoofers. The Kicker KM Series 10 marine and boat waterproof subwoofer is designed specifically for the outdoors with a Peak power of 300 watts and a RMS power of 150 watts. Equipped with removable multi-color LED accent lighting that can be changed to fit your craft or mood. It comes with an easy-to-match charcoal basket, with a protective, bolt-through grille that includes a smart, integrated moisture-draining system. Designed specifically for boat audio with weather-proof qualities that meet or exceed industry standards. Features an injection molded cone and tough Santoprene® surround, both UV-treated to combat the weather. 30 Hz 500 Hz Frequency Range. 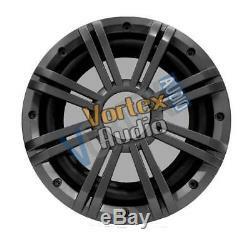 Vortex Audio return period is 30 days. All products must be securely protected in double packaging and padding. Misuses such as blown sub-woofers/speakers are not covered under our return program. Used items and/or items that are not in resealable, like-new, condition as outlined above may incur additional surcharges, up-to return denial, at our discretion. PO BOX or to any destination outside of the 48 continental US states, including international locations (restrictions apply). Failure to provide one will result in delays. The item "Kicker KM10 10 300 Watts Marine Subwoofer Waterproof Sub LED Lighted 41KMW104LC" is in sale since Tuesday, June 12, 2018. This item is in the category "Consumer Electronics\Vehicle Electronics & GPS\Marine Audio". The seller is "vortexaudio" and is located in Philadelphia, Pennsylvania. This item can be shipped worldwide.